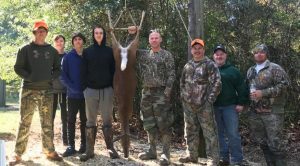 This past weekend Truth in Nature in Bush, LA, led by Program Director Michael Rivers, held its November deer hunt for the remaining young men that qualified to deer hunt this fall in this chapter. It was an awesome weekend with better weather than the first deer hunt and even better results! As we usually do, things started up Friday when the moms dropped the boys off and we headed over to the camp to get going with the program. Dinner was served and it was delicious as always. We are blessed to have Mandy Rivers faithfully serving the boys and mentors in this capacity. 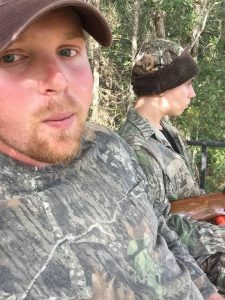 During this time each young man learned what mentor they would be teamed up with, and what stand location they would be hunting on Saturday. Shortly after dinner we gathered around the fire to have some man time, just talking life, deer hunting, and just some fellowship growing, and building relationships between mentors, and boys. We hit the bed early because we knew it would be an early, and long day hunting on Saturday. Saturday was met with anticipation from all the boys as we woke up ready to hit the deer stand. After grabbing a little breakfast, we all loaded up, and hit the stands. Each mentor and boy parted ways to hunt their stands, and hopefully bag a deer for the young men. It was a cold Fall morning, and the setting was just right. Shortly after daylight a shot rang out, and everyone went on alert wanting to know who made the shot. Isaac Dunaway had taken his very first deer alongside mentor Daniel Lombardo! 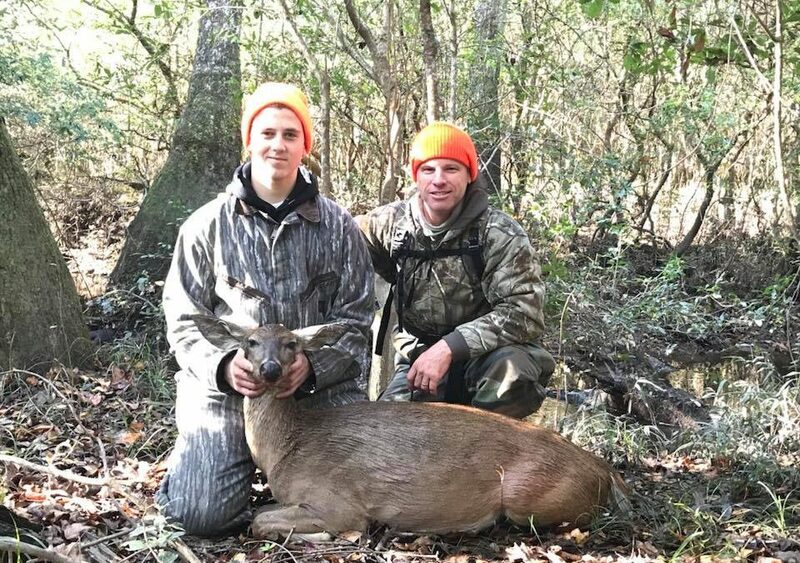 It was a nice Louisiana doe! High fives, smiles, and congratulations could be heard all over. The morning was a great one, but no other deer were harvested. The group got back to camp where we took care of dressing the deer and giving Isaac the traditional first deer rituals. After that we settled in for a great lunch, and heard a challenging devotional from mentor Scot Martin. We took a little break, and enjoyed some Annie Oakley competition between boys and mentors. It was lively competition, and a great way to take some down time before hitting the stands. As the day went on, the boys, and mentors got settled into their stands for the afternoon hunt. It was again great weather conditions to end the day. 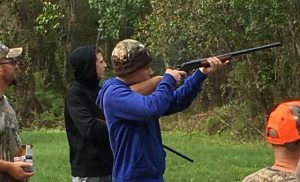 There were deer seen that afternoon, but none presented a shot, however all the group enjoyed their time in the woods to cap off a great program. Thank you all who continue to pray for these programs, mentors, and boys. We appreciate your partnership. If you would like to be a part of Truth in Nature and help continue God’s mission to Reach, Inspire, Support, and Engage these young men from fatherless, and single parent homes, please contact us using the chapter or staff pages on this website. You can view all the pictures by visiting the link below.